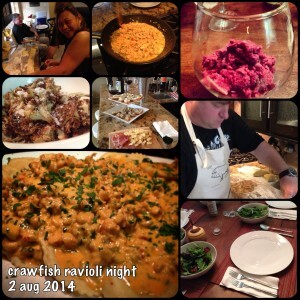 Crawfish Ravioli Night | Just Cuc It! We shared a lovely evening with some of our dearest friends this past weekend. One of the many things that connects us is our love of food and our appreciation of the culinary art! During crawfish season a few months ago, we all rolled up our sleeves and peeled at least 5 lbs of leftover awesome crawfish boil crawfish knowing they would soon play a pivotal role in the legendary Crawfish Ravioli night. We missed last year’s ravioli night and I’d been anticipating this event all year long! Last year, Sean taught John how to roll and stuff the pasta. This time, I got the lesson 🙂 It was so much fun. We rolled, stuffed, and cut over 50 delicious morsels. Josh got to play sous chef as well as he assisted Sean in preparing the crawfish cream sauce. Nothing beats the smell of sautéed garlic and Italian herbs in olive oil. . . 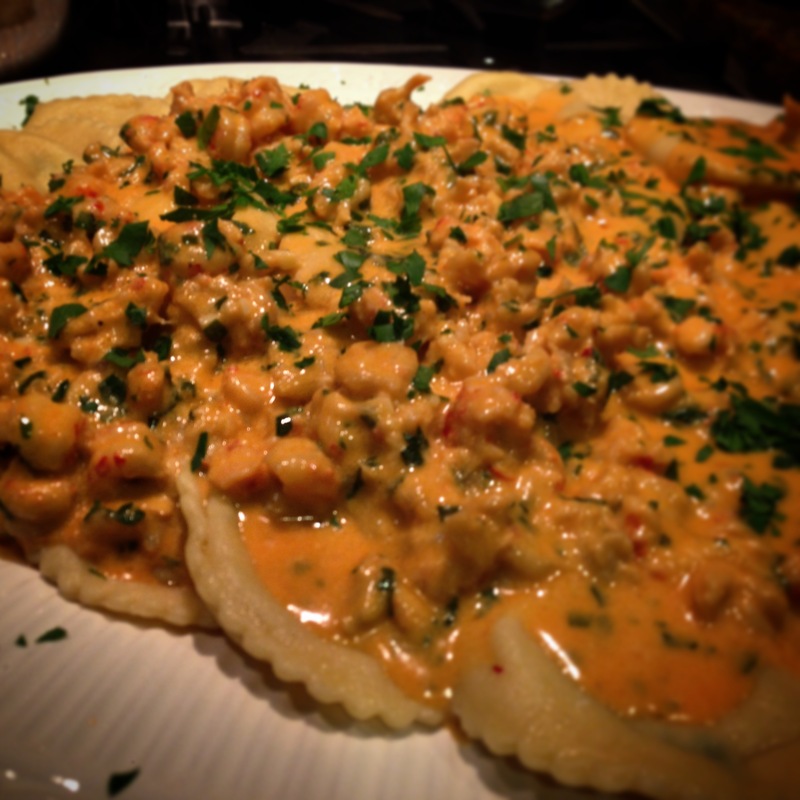 The table was set perfectly… a glass of red wine, nice spring greens with roasted garlic dressing, roasted cauliflower and the star of the evening: a platter of homemade ravioli stuffed with crawfish, ricotta and herbs topped with more crawfish in a creamy, tangy sauce. He created a red wine sorbet that was simply divine. Smooth, delicious and refreshing . . . It was the perfect end to the evening. My taste buds are still doing the happy dance! Cooking, laughing and learning new things in the kitchen was a ton of fun that night, but the real joy for me happened the way it so often does with my group of special friends . . . the food inspired endless conversation about travel abroad, different types of wine, different techniques of cooking, sharing stories of yesterday, our loves for today and our dreams for tomorrow. Delicious, pasta dish with a spicy cajun kick! Make the dough. Mound the flour on a large cutting board and make a wide well in the middle. Add the eggs and olive oil and season with salt. Beat the eggs with a fork, then use the fork to break the wall of the well and incorporate the flour into the eggs. Gather the dough into a ball; don't worry if there are lumps. Knead the dough. Using the heels of your hands, push the dough away from you, then fold it back over itself and push again (put your whole body into it!). Continue kneading until the dough is smooth and supple, 10 to 15 minutes. Wrap the dough in plastic wrap and let rest at least 1 hour at room temperature. Mix all filling ingredients in a bowl using a hand blender or food processor. Cover bowl and refrigerate until we need it later. Make the sauce. Drizzle olive oil into a large deep pan. Saute garlic . Add bell peppers, onions and cook down. Add the seasonings and powders and set aside once veggies are soft. You’ll add the shrimp, crawfish , cream and chives when raviolis are ready to be served. Roll out the dough. Cut the dough into four pieces. Flatten one piece slightly, then run it through the widest setting on a pasta roller twice, dusting with flour in between if it feels sticky. Fold the length of dough into thirds and run it through the roller two to three more times. Continue running the dough through the roller, reducing the width setting between each run, until you reach the second-to-last setting and the dough is about 1/16 inch thick. Repeat with the remaining pieces of dough. Assemble the ravioli. Place the lengths of dough on a floured surface. Lightly brush the lower half of each strip (the part closest to you) with water. Spoon filling onto pasta and fold the dough over the filling to meet the bottom edge. Press around each ball of filling with your index fingers, making sure there are no air bubbles. Cut out the ravioli using a 2-to-3-inch round fluted cutter. Transfer to a baking sheet dusted with semolina. Cook the ravioli. Bring a large pot of well-salted water to a boil; add the ravioli and cook 3 to 4 minutes. Transfer with a skimmer or slotted spoon to resting plate. Bring the sauce to a boil and add shrimp and crawfish and cream. Cook 4-6 minutes until shrimp is cooked and sauce has thickened.